The 1 December 1958 issue of Aviation Week included an article, Soviets Flight Testing Nuclear Bomber, that claimed that the Soviets had made great progress in their own nuclear aircraft program. This was accompanied by an editorial on the topic as well. 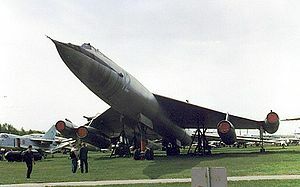 The magazine claimed that the aircraft was real beyond a doubt, stating that "A nuclear-powered bomber is being flight tested in the Soviet Union. ... It has been observed both in flight and on the ground by a wide variety of foreign observers from Communist and non-Communist countries." In reality, however, the article was a hoax. The aircraft in the photographs was later revealed to be an M-50 and not a nuclear-powered plane at all. Myasishchev M-50 Pictures and Myasishchev M-50 for Sale.